There are signs relating to classic Disney animation all throughout the parks in Walt Disney World. Without a doubt the majority of these tales are remembered through their attractions, but we’re talking little details here: Ichabod’s music lessons, Lucifer hanging around the wishing well, the Maroon Studios billboard, and too many others to name. One of the most recent additions to the Magic Kingdom, Mickey’s Town Square Theatre, features many nods to films of feature animation past. 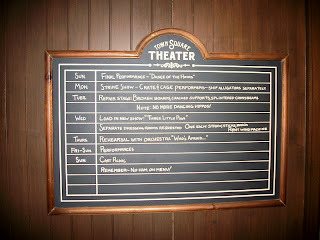 One such piece is this schedule board for the performances held at the hall. The first week is rounded out with the final performance of “Dance of the Hours,” the shipment of the creatures tied to the show, and the replacement of the stage due to. Perhaps naively, the unforeseen damage achieved by dancing hippos. Dance of the Hours is the sixth segment from the 1940 film, Fantasia, and the ballet written by Amilcare Ponchielli. The animated version from Fantasia includes the aforementioned dancing hippos as well as alligators, elephants, and ostriches that join in the ballet festivities. 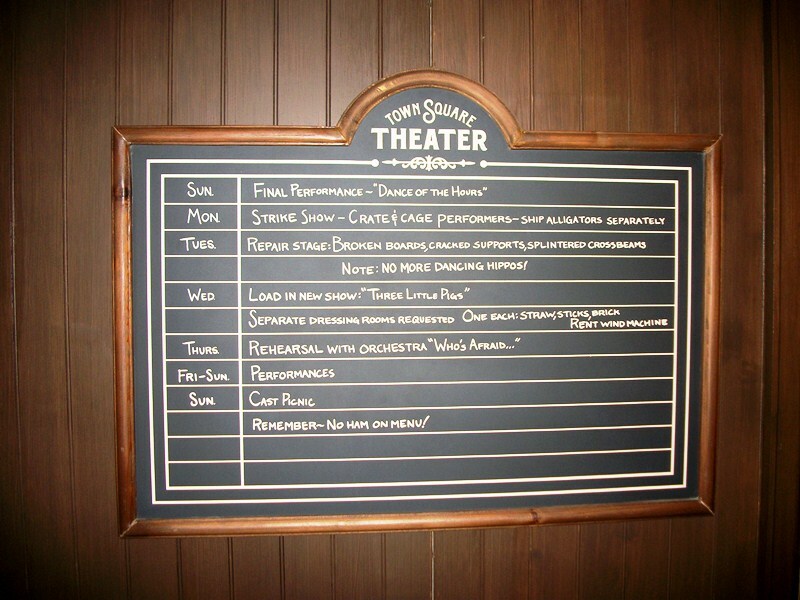 Following the Dance of the Hours is “Three Little Pigs.” The remainder of the week is filled with dressing room set-ups (straw, sticks, and bricks), rehearsal of Who’s Afraid of the Big Bad Wolf, performances, and a picnic lunch (reminder of no ham on the menu). The Three Little Pigs was a 1933 Silly Symphony which went on to win the 1934 Academy Award for Best Short Subject – Cartoon. Not only was the song, Who’s Afraid of the Big Bad Wolf, prominently featured in this short, it was the perfect showcase for the musical pigs who played the flute, piano, and flute. Obviously, if this theater is supposed to live in turn of the century Main Street, U.S.A. we have to disregard the years in which the general public actually learned about these fantastic characters. Of course, one solution is that in the world of all things Disney these characters performed on stage before they moved on to animated features later in their careers. Hey, anything is possible if you believe in magic, right?